In today’s hectic world, most households revolve around kitchens—where all the evidence seems to land. Let MS Simplicity spoon-feed you the basic ingredients of a creatively organized space to suit your particular needs. Simply Organized’s short chapters divide the onerous tasks of culling, decision-making, downsizing, and donating into bite-sized portions that fit into your busy schedule. The step-by-step instructions are easy to follow, easy to master. A handy checklist tracks your progress and lets you rearrange the order of attack into your customized recipe for success: a freshly organized kitchen. 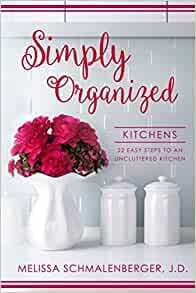 Start reading Simply Organized: Kitchens on your Kindle in under a minute. 5.0 out of 5 starsHave a kitchen? You NEED this book! This book is incredible. My kitchen is organized and I am using space efficiently and don't have 20 Tupperware lids falling out of cupboards. Kids understand where everything is and it has its own place. MY KITCHEN IS ORGANIZED AND LOOKING CLEAN AND FRESH FOR THE FIRST TIME EVER...NO CLUTTER!!! Fresh flowers on table dress up everything! Melissa does a great job of writing in an easy to understand manner. She breaks it down to accomplish each task super easy! This is a great challenge to do and redo every couple of years! 5.0 out of 5 starsSimple and Sweet! I loved this book! It was simple and practical. I am already using some the tips! 5.0 out of 5 starsWell-written with great ideas! Easy reading style with wonderful advice for getting and keeping your kitchen clutter-free and organized. I highly recommend this sweet little book! Lots of great tips for your kitchen! 5.0 out of 5 starsFor anyone who hungers to live more simply and more authentically, starting in the kitchen. Melissa understands how to help you make the most of your kitchen. The wisdom shared in this book is practical enough to help you tackle the kitchen, and yet it can help you tackle other rooms and ideas, as well. The book is presented in a day by day, step by step manner. It's as if you have your own personal professional organizer right at your fingertips. Schmalenberger is wise and writes from a place of knowledge and heart. She gets it! I love the layout of this book. The formatting is clean and the content easy to follow. It is divided into very 'doable' chunks and down to earth advice. This is definitely a solution based "do" book and not just a fun "look" book. The tips offered apply to more than just kitchens, yet I would love to see Melissa work her way through the house!